I have a real interest in making my own gear and researching / reviewing gear that I do happen to purchase. Making your own gear is really satisfying and saves you a wadge of cash too! 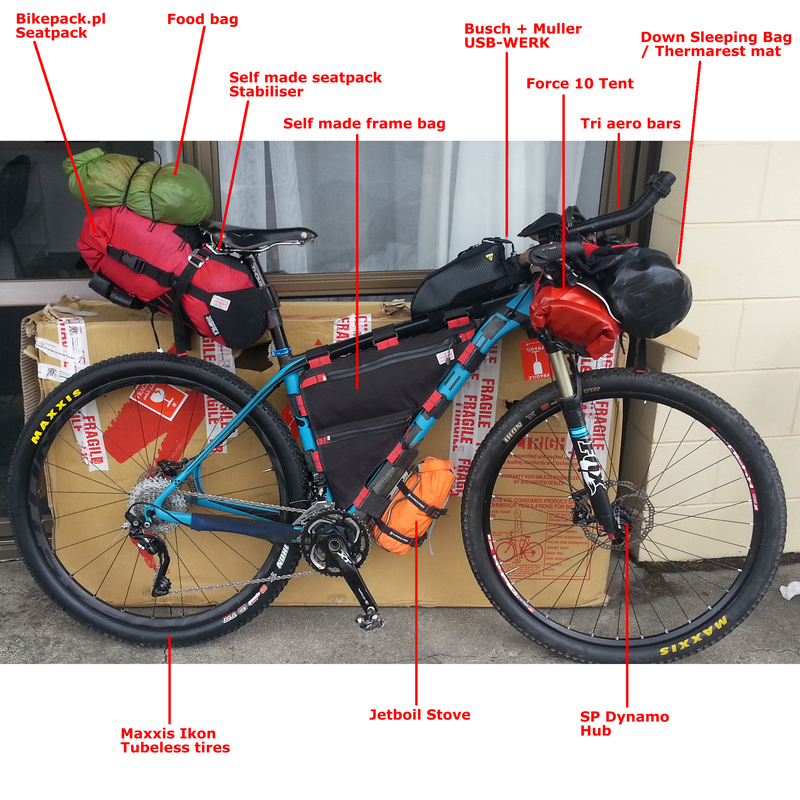 My current setup is shown below and I have used this setup, for both the Tour Divide and the Tour Aotearoa rides. It works well and aside from wanting to move to a thru axle setup for the front and rear wheels (expensive change) there is nothing I would change. If it ain’t broke then why fix it! Standout items for me are as follows. The dynamo hub and USB-Werk are a must have. Keeps both phone and Garmin 810 charged and removes the worry of them going flat. Maxxis Ikon tyres. I have been really impressed with these tyres and I am on my 3rd set. These roll really well and the TR / 3C / Exo /Exc version are bomb proof. Aero bars I hear you say? On long multi day rides these provide a great way of being able to give your hands a serious rest. On long straight sections you can hunker down, churn out the miles and take the weight off your hands. They are a must have and will potentially ensure that on multi day rides you don’t end up with nerve damage. As much as they look rather odd on an MTB I find them essential and worth the slight weight penalty.